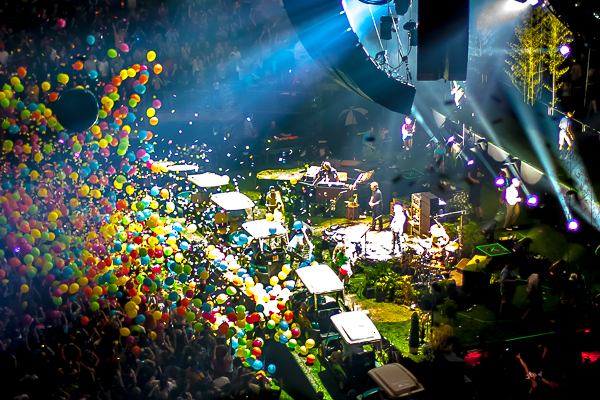 Barring a flux capacitor, no one could have predicted the complete change of direction 3.0 phish took in 2012, let alone from last year’s “Steam” stunt to this year’s golf-themed funked-out classic New Years Eve throwdown into 2013. That juxtaposition from last year’s New Year’s Eve low energy affair that garnered much criticism from the band’s outspoken fanbase to this entire 2012’s stellar record of epic shows appeared to be the impetus behind the band choosing “Garden Party” as their opening number at MSG. Upon entering MSG, phans (some of whom paid as much as $1500+ for a scalped ticket) were greeted with lush green astroturf/grass on the stage and GA floor and perhaps the first time in the band’s 30 year history, people enjoyed lawn seats at an indoor venue. Complete with sunbathers, croquet, badminton and picnickers, the stage was literally set for a Garden Party. Little did we know however, that an obscure phish-geek-stat-guy- type of song would prove to be the tee box for a golf-themed third set party that ensued in the wee-hours of 2013. 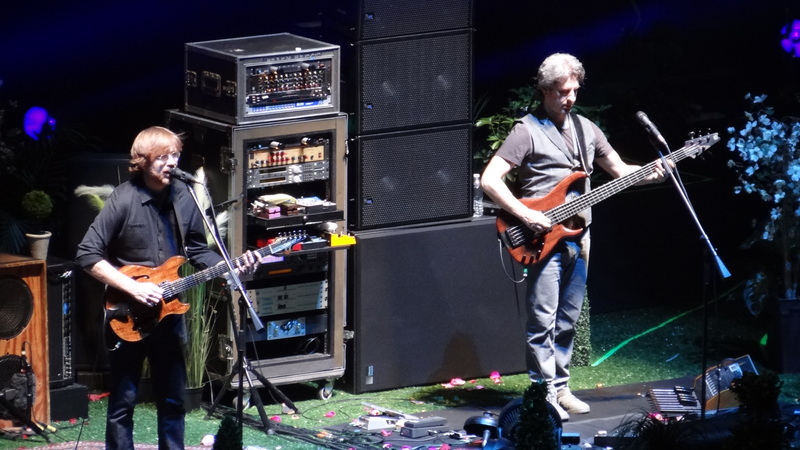 Once lyrics were clearly delivered by bassist Mike Gordon, it became obvious why the band chose to start their 3-set throwdown at the Garden with such an poignant, anticlimactic song. However, no one in attendance could have predicted the actual Garden Party that ensued hours later. Phish has always walked the line of music-geekery and headier-than-thou status among jam fans with their setlists. 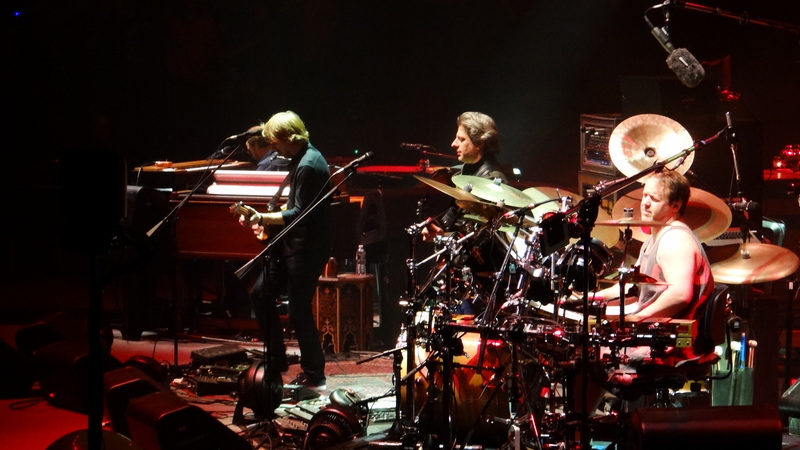 Perpetuating that pervasive purgatory, Phish delivered a masterful setlist for all, satisfying both the jam-centric lovers of “Ghost”, “Piper”, “Sand” and also for phans who love Phish for well-documented New Years’ antics. Following “Garden Party”, the band moved into one of their 1.0 staples, “Possum”, which appeared to be specifically chosen for that slot after Garden Party, in response to perhaps, previous phans criticism of the band overplaying the old fave too many times during Summer Tour. Can you imagine? The disgust and outrage! However, this 10+ min Possum was delivered flawlessly and was a great energetic springboard for easily, the band’s most energetic set of the three on New Years Eve. From “Possum”, they went feverishly through Ween’s “Roses are Free”, “Rift” and a thoughtful “Sample in a Jar” that prompted many noteworthy compliments around my section 102 at the Garden. From there, they played “Alaska” and a great “Mike’s Song”, but rather segue into the traditional “Hydrogen>Weekapaug Groove”, the band dropped a rousing “Walk Away” cover before going into a frenetic, high-paced “Weekapaug” (Perhaps the best MSG version since 1995) that saw Trey Anastasio jumping, spinning his red locks and keeping his vertical head bobbing with his signature “Trey Face” that just continued to whip the Garden crowd into a frenzy. Finally the band wrapped up the 70 min set with an upbeat “Character Zero” that just wet the pallets of everyone in attendance for a dark, funky second set filled with historic jam vehicles from the Vermont quartet. The second set began swiftly with crowd favorite “Birds of a Feather”. A rather rudimentary rendition, the band simply spring-boarded that energy into the start of “Ghost”, which would be the last time the band would stop between songs during the second set. During the next 65 minutes, Phish simply segued between songs playing puppet-master of crescendos with “Ghost>Piper>Light>2001>The Horse->Silent in the Morning>You Enjoy Myself.” The highlights of the set, hands down, were the quickly revved up Piper with early dashes of the epic Vegas 2003 version, and a 2001 that while short (like nearly all 3.0 ‘Sprach’s) had brief, deep concentrations of syncopation. Phish then appropriately slowed it down with a dash of perfectly placed Horse/Silent and gently placed the cherry atop the set with the always anticipated “YEM”, so much so during these 4-night runs that it’s previously prompting the lot acronym “YEMSG.” While typically not always a fan of the concluding YEM ‘Vocal Jam’, this year’s version was eerie and possibly intentionally weird, only foreshadowing the “Bizarro-Golf-Garden Party” that was about to ensue after the 30 min setbreak. During setbreak, the music notably included some gag hints, including Fresh Prince’s “Summertime” with phans energy soaring and crowds singing along. Around 11:45 pm, Phish returned for their final notes of 2012 and their first of 2013. It was a perfect 15-minute entertaining reprieve from the sweaty Garden crowd dancing their asses of. It was quite entertaining w/ Trey, Page Mike and a caddie-adorned Jon Fishman hitting tee shots into the crowd.Kicking things off w/ a fun “Party Time” before moving a 27-yr old obscure Phish chant “Kung.” Starting dark and creepy w/ odd lyrics including the lines “Can we stand?…Can we stare? We can stage a run away golf cart marathon!” (Unbeknownst initially to even this old 17 year jaded vet) Basing this song as this year’s NYE theme (2010 was “Meatstick” and 2011 was “Steam”) Kung allowed the band to unleash a feverish on-stage Garden Party including midgets, dancers, the band hitting foam golf balls into the crow and an aforementioned “golf cart marathon” rapidly moving across the stage and through the backstage MSG tunnels at a frenetic pace. Following the entire dimpled display, the foursome continued into classic upbeat “Chalkdust Torture” where the band brought us into 2013 with everyone in the garden hugging it out over “Auld Lang Syne.” Following Auld Lang Syne, Phish capped off the 28th’s “Tweezer” with “Tweezer Reprise”, a great selection to commemorate 2012m considering NBC famously used ‘TweePrise’ as its audio accompaniment for its much heralded Gold-Medal video montage of Michael Phelps. 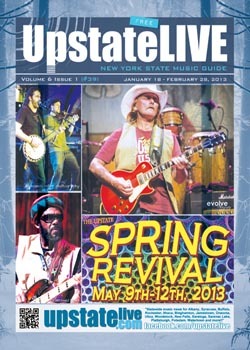 I encourage UpstateLIVE readers to check out Youtube videos of this gag which includes a powerful “Tweezer Reprise”, complete with female backup vocals, featuring Syracuse’s own Carrie Manolakos. Following the ‘Reprise’ is just one more reason to either love Phish for their quirkiness or hate them for breeding setlist thirsty stat geeks. Follow me here: along with the golf-themed “Garden Party” third set, the band also made a point to play golf-themed songs from their catalog and bust-out covers with “Sand”, “The Wedge” a masterfully played debut cover of Steve Miller’s “Fly Like An Eagle”, a rocking “Wilson” (with a Wilson-logo golf ball appearing on the MSG jumbotron) and a doo-wop version of “Lawn Boy”, before closing out the occasion with the encore of “Driver” (first attempt botched by band has led to online speculation they initially flubbed “Driver” as to try again ala ‘using their mulligan’) and a classic rock-n-roll bustout cover (and first time played the extended rock ballad version) of Black Sabbath’s “Iron Man.” (Many phans also debated whether the song “Par Tee-Time” aka Party Time was also intentional by the band). 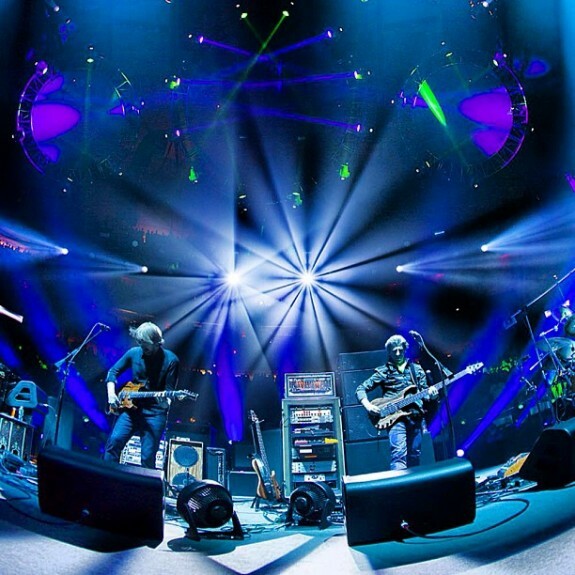 When the lights came around 1 am in 2013, the Phish crew had even orchestrated Kenny Loggins’ “I’m Alright” (from Caddyshack) as the departing chorus. Oblivious to many saggy-eyed faithful, it was just one more observation on how this band is still putting the inside-joke on us. While the night before was musically my personal favorite show of the four-night run, with 12/28 and 12/29 paling in comparison to the run’s latter shows. But Phish knows it not about how you start, but how you finish. That was evident with the entire 12/31 show including this monster version of “Iron Man” which proved to be historic. In return, the entire sweaty Garden crowd appeared thankful Phish chose such a powerful, energetic, classic song to close out what has been heralded by phans and myself as thee best year in Phish 3.0. The 220th different song of the year, “Iron Man” that Phish played, in some way, symbolized a band that had just wrapped up their 27th show at Madison Square Garden and triumphantly began their 30th year as one of most successful touring acts today: definitely an ‘Iron Man’ feat this day and age. The opening night of Phish’s New Year’s run left little to be desired. The band came out and eased through a first set, before dropping the defining ‘Wolfman’s Brother’ of the so-called 3.0 era. The second set, well you’ve heard about the second set. There is little to say about it other than it was one of the best sets of Phish I’ve seen in a long time. Understandably, the proverbial bar was set incredibly high for the second of the four shows. With mid-town Manhattan lit up with cheer, lights and lagers, it was an easy stroll into Madison Square Garden, a place that has become a second home of sorts to Phish. The crowd ready, aside from the stragglers staggering in, the quartet opened with a standard ‘Crowd Control’, an uninspired ‘Mound’ and a standard ‘AC/DC Bag’. It wasn’t anything spectacular, but it felt like Phish was getting the opening jitters out. Then came ‘Rock and Roll’, a Velvet Underground tune that Phish has slayed countless times in the band’s career. After the standard part of the song, guitarist Trey Anastasio jumps into the lead, laying down relentless licks over a true rock and roll backing. The ending “It was alright” chants were inspired, and it seemed as if Phish was starting to take this show to a new level. Then, BOOM. Sorry for the personal touch, but I love ‘Sugar Shack’. It seemed like it was slightly re-worked, with Anastasio playing a slightly more rhythmic riff under bassist Mike Gordon’s boppy bass line. Anytime Phish plays ‘Sugar Shack’, I go nuts, therefore I suggest you listen to the song instead of me. It’s one of the best songs Gordon has penned. ‘Reba’, a short ‘Halley’s Comet’, ‘Limb by Limb’ and a somewhat extended ‘Wading in the Velvet Sea’ add a softer touch to set. An inspired ‘Bathtub Gin’, with a slow ascension complete with a ‘Suzie Q’ segment, followed by some exploration with Anastasio again taking charge with ferocious licks, closed out a well-played set. ‘Golden Age’, a song that debuted in 2009 (A TV On the Radio cover), opened the second set. I am still not sold on this tune, aside from the Superball version (which I believe is a Top-10 3.0 jam) because it just doesn’t do it for me. The jam that came out of it had the fans around me raging, dancing and high-fiving, and was engaging, but I was still high from the ending of Wolfman’s, so maybe I wasn’t listening closely enough. ‘Waves’ then bled into ‘Prince Caspian’ before the pace picked up with a tight, fast ‘Boogie On Reggae Woman’. Gordon tears the ending into a meatball-bass free-for-all. ‘Suzy Greenberg’, ‘Bug’ and ‘Cavern’ fill the next few slots before the arena-rocker ’46 Days’ makes an appearance. Again, Anastasio takes the lead and builds up several tension and release riffs. It’s becoming apparent that while Phish isn’t taking many risks on this night, Anastasio has decided he’s going to put that Languedoc to the test by bending and building notes until the place explodes. ‘The Squirming Coil’ started a three-song encore, followed by ‘Grind’ and a rollicking ‘First Tube’. This show was pure fun. Tightly played music with some exploration and certainly some guitar lessons from Anastasio. It definitely was different from the first night, but no doubt this show deserves a listen or two or ten. In fact, the energy comes through in the LivePhish recording. Go on a long run and you won’t stop until this show ends.